Most of my radio activity takes place in The Shack, but I also have a couple of antennas which connect directly to the house. I have a very simple 1/4 antenna for 145 MHz and a dual-band colinear array (Diamond X-30); a typical (small) white stick antenna. What I notice is that on 2 metres FM, chatting with local stations, I usually get better signal reports on the simple ground plane 1/4 than on the colinear (which supposedly has 3 dB gain on 144 MHz [ here ], although it is not specified to be dBd or dBi). 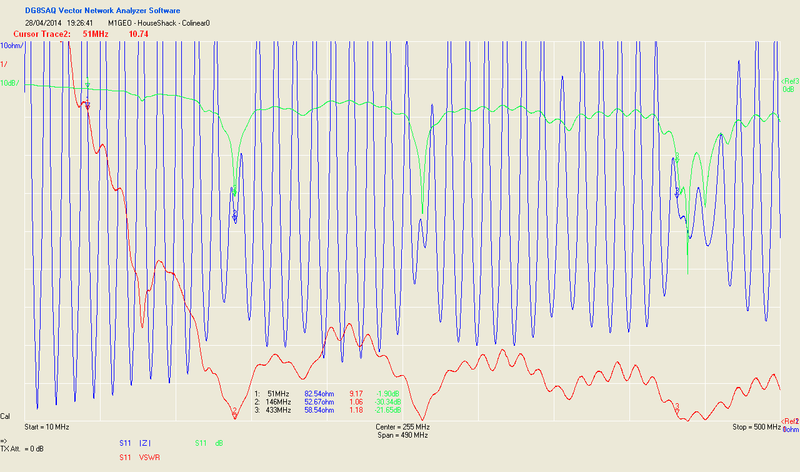 Having done an demo/example session of using a vector network analyser at the radio club, I decided to connect up the antennas here in the home-shack, to see what the odd signal reports were about. For each image, the VSWR at a given frequency is shown in red, absolute impedance is shown in blue and insertion loss is shown in green. Insertion loss is a useful metric to observe as that shows how much energy is radiated on each frequency (neglecting coax losses), which, ultimately, is all we are interested in. Firstly, I had a look at the simple ground plane 1/4 . 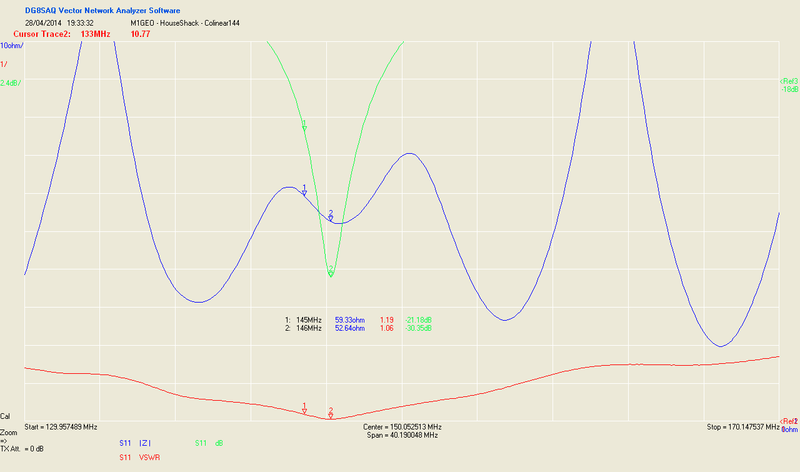 The image below shows a sweep of frequency around the 2-metre (144 MHz) band. 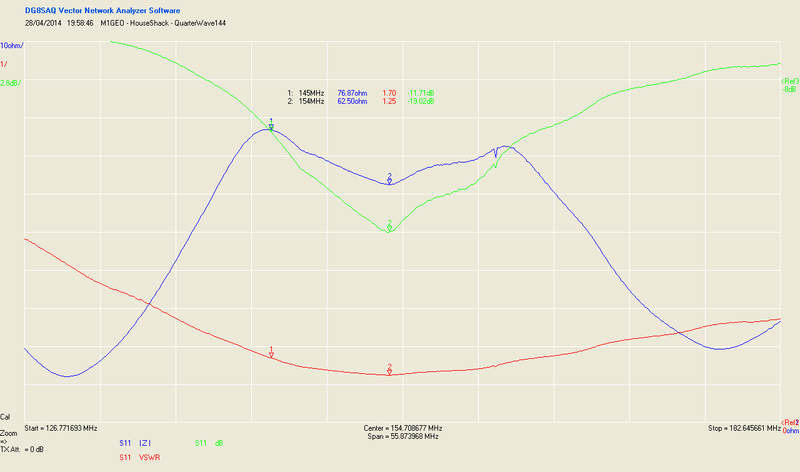 What can be seen is that the antenna is tuned quite a way off frequency; marker 1 shows the characteristics at 145 MHz (R=77 Ohms, SWR=1.7:1, Loss=-12dB). The actual resonance is at 154 MHz. Next comes a complete sweep of the Diamond X-30 colinear. I couldn’t remember if the antenna was of any use on 6-metres (50 MHz) and so I started the sweep low so I could see. As is apparent, it is not. I notice there is a resonance at approximately 260 MHz – initially, I thought this may be to do with the American 1.25-metre (222 MHz) band, but alas not. My guess is that it is an unintentional resonance because of the physical construction of the antenna. The last two images are close in sweeps of the 2-metre (144 MHz) band and the 70-centimetre (433 MHz) band on the colinear. 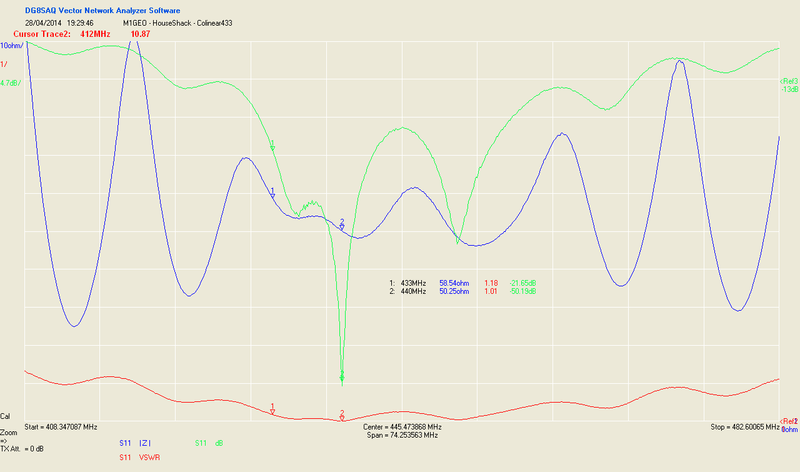 At 145 MHz, R=60 Ohms, SWR=1.19:1, Loss=21dB.